Our salon emerged out of passion… The passion of our trade, which gives us a great satisfaction, strengthened by positive opinions of our clients who keep coming back to us and recommending us to their friends and families. The owners, beautician and manicurist both by profession and passion, gather around them only those who, like themselves, perform beauty treatments with true devotion. All of us we try to keep up with various novelties from the beauty world and introduce them in our offer. We participate in beauty congresses and trade fairs regularly. Our clients not only can enjoy beauty treatments performed in our salon, but we also advise them how to proceed with their beauty care at home. We consult different beauty issues and offer professional products for home care after precise skin diagnose. Beautician, health tutor, mentor of the Bernard Cassiere brand in Poland. Liliana has been working in beauty trade since 1992. 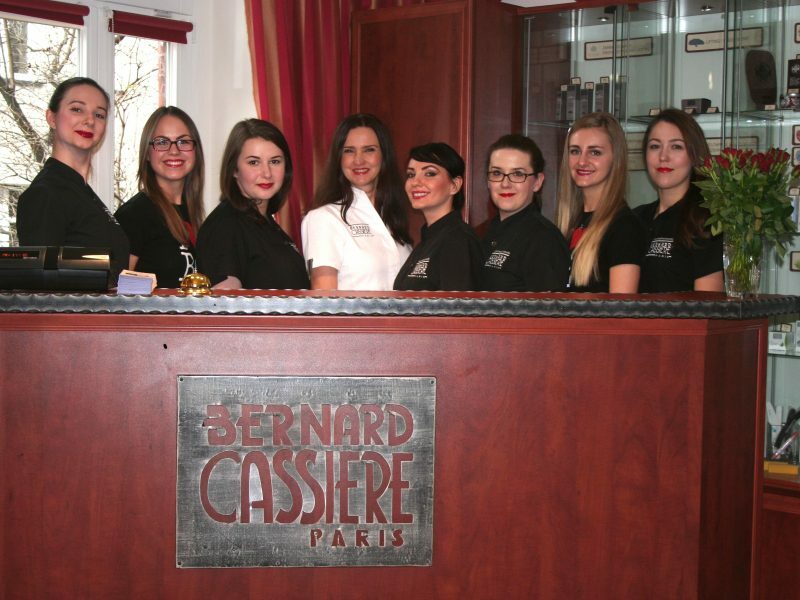 She launches Bernard Cassiere’s treatments on Polish professional beauty market. She performs face and body treatments, consults and diagnose skins, selects appropriate beauty home care. – courses of: DRM massage, anti-ageing massage, theatre and film characterisation, electrocoagulation, laser epilation, trainings of cosmetic techniques in Paris and Brive, France. Liliana performs professional trainings of Bernard Cassiere products. She is the originator and cofounder of beauty congress – Silesian Cosmetic Meetings. She has trained her technique in Paris and Brive, France. She is Bernard Cassiere Polish trainer. In our salon Honorata performs face and body treatments, eyelashes thickening with the „eyelash to eyelash” method, permanent eyelash curling, permanent epilation, massages, professional make-up, laser epilation. She specializes in therpeutic pedicure and the reconstruction of the damaged nail plate. She consults clients with podological problems, helps to determine the appropriate prevention of these problems. Honorata has certificates for applying wire buckes VHO- Osthold Perfect and BS Quick. As the Polish Bernard Cassiere trainer, she performs BC brand trainings and treatment techniques. Cosmetologist, manicurist, pedicurist, health promoter,biological wellness specialist. She graduated from AHE and GWSH. In our salon she performs hands and feet care, nail styling and body treatments. She graduated from GWSH as cosmetologist. In our salon she performs hands and feet care, nail styling, face treatments and laser epilation. She graduated from GWSH as cosmetologist and from Medical University of Silesia where she received masters degree of cosmetology. In our salon she performs face treatments, laser epilation, depilation, eyelash thickening and nail styling. A student of cosmetology at Post-secondary Medical School of Silesia. Patrycja is our website administrator, she corresponde with our clients and promote our services.